Blackberry manufacturer RIM's co-chief executive has hit back at Steve Jobs recent attack on his company and products. Research In Motion's Jim Balsillie was responding to comments made by Steve Jobs earlier this month, in which Jobs said he could not see RIM catching up with Apple in the smartphone market, taking some time out to trash the idea of a 7-inch tablet PC at the same time. 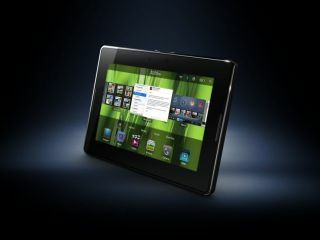 RIM is of course readying its very own 7-inch tablet PC, the PlayBook. "We think many customers are getting tired of being told what to think by Apple," wrote Balsillie on RIM's blog. "As usual, whether the subject is antennas, Flash or shipments, there is more to the story and sooner or later, even people inside the distortion field will begin to resent being told half a story." Specifically, Jobs had said of the BlackBerry manufacturer: "We've now passed RIM and I don't see them catching up with us in the foreseeable future… I think it's going to be a challenge for them to convince developers to create apps for yet a third platform after Apple and Android's App store." Jobs also added: "The seven inch tablets are tweeners, too big to compete with a smart phone, and too small to compete with an iPad. The current crop of 7 inch tablets are going to be DOA, dead on arrival." "For those of us who live outside of Apple's distortion field, we know that 7" tablets will actually be a big portion of the market and we know that Adobe Flash support actually matters to customers who want a real web experience. "We also know that while Apple's attempt to control the ecosystem and maintain a closed platform may be good for Apple, developers want more options and customers want to fully access the overwhelming majority of web sites that use Flash."